The Indies: An Animated Short runs 5 mins and 40 seconds, and was produced in Toon Boom Storyboard Pro and Toon Boom Harmony in nine months. It has already gathered massive buzz online; its Kickstarter crowdfunding campaign raised over $50,000 in less than 35 days and it has received press coverage in a variety of hip-hop publications. 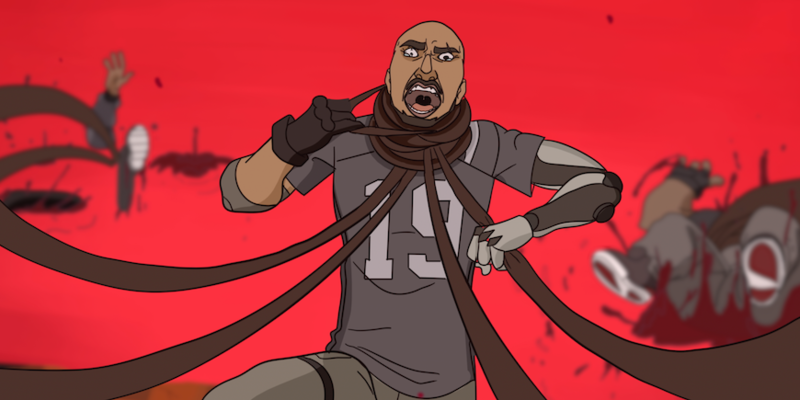 Toon Boom caught up with Tony Drake ahead of The Indies: An Animated Short’s launch tomorrow to chat hip-hop animation, his advice for other independent animators, and where this short will go and grow. Hi Tony! What led you to The Indies: An Animated Short? TD: Oddly, this whole project started out as a mixtape. I wanted to create music and was looking for a way to make it stand out. I’ve always been a huge fan of cartoons that intertwined music with action, so I thought that could be my niche — the only problem was that I can’t draw and I didn’t know anyone in animation. I started researching what’s involved in animation production, the best way for me to get funding and where to find a team of animators; fast forward eight years later and we have The Indies: An Animated Short. Having started as mixtape, what role will music play in the series? TD: I always tell people that the music is one of the characters. On the same day we launch the short, we’ll also be releasing a single called “Trouble” that is played throughout the film. It’ll be available on iTunes and all the streaming platforms like Apple Music, Spotify and Tidal. If you like supporting good hip-hop, please check it out. Clearly there has been huge support for The Indies, based on your Kickstarter success. Why do you think that is?TD: There’s a massive audience for stories told through a hip-hop lens, and for a long time we just haven’t been seeing that in animation. I think The Indies showed up at the right time to help fill that void. Luckily, over the past year, we’ve begun to see more hip-hop in animation with LeSean Thomas’ Yasuke and Noir Cesar’s Primus 7, but there are more stories to be told. How did you come up with the musician-turned-mercenary plot? TD: It’s really just my take on the modern-day entertainment industry — someone comes to you and says they can make you a star. If that’s all you’ve ever wanted, you might be willing to do anything to make that happen. And although the story focuses on the entertainment industry, it can apply to anyone that has a dream; it’s all about how far a person will go to get what they want. And how long was production and how many animators worked on The Indies? TD: The production took nine months and we had nine character animators. When you watch the full credits, I think we had around 40 super talented people touch the project. How did working with TB Storyboard Pro and Harmony help with production? TD: My co-director Chaz Bottoms, creator of All Kids Go to Hell, can better explain this one. 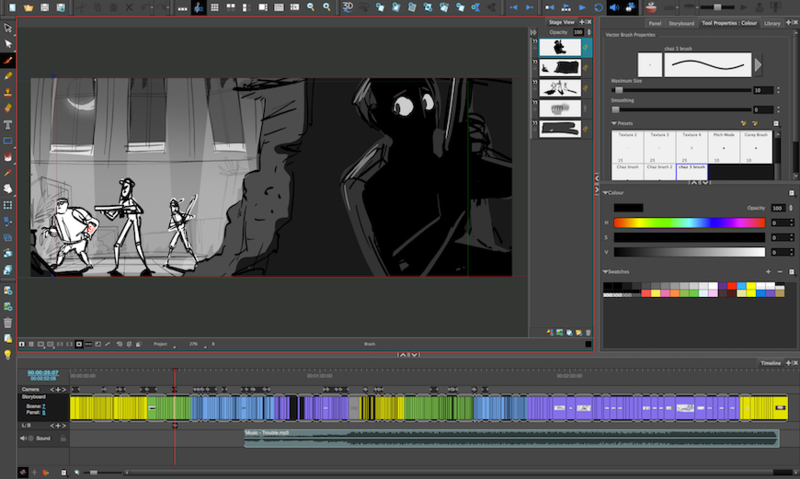 CB: Using Storyboard Pro on a project that depended on keeping the rhythm of the music gave us the ability to make edits and timing choices in the pipeline, which was huge! Being able to quickly test different edits allowed us to lock in our timing going into production. It also kept us organized from a shot perspective, which is what shaped our production schedule. With Harmony, we really took advantage of the colour pallets and being able to layout our camera moves. The software is so animation pipeline friendly, we were able to see rough to line to colour and shaded animation every step of the way. We were also able to have that attention to detail needed to execute our vision. Any advice you’d give to animators following in your footsteps? TD: The best advice I could give is just do it. Don’t let fear and the unknown stop you from chasing your dreams. Look, if you’re reading this and you can draw, you’re already a million years ahead of where I was when I started. Get out there and tell your story. Great advice. Any tips for leveraging crowd-funding platforms to support animation? TD: One of the biggest misconceptions about online crowdfunding is people think they can do it all online. I found that’s not really the case — you have to get out and connect with people. You need to learn who your audience is and where they are. For example, I would table at comic cons during the Kickstarter because I know that a lot of those same comic-book readers are also watching cartoons. Without fail, every time I would go to an event in-person, I would see a huge spike in backers. That makes sense. So, after launching the short this week, what’s next? TD: Without a doubt I want to see The Indies grow into a series. During those eight years of research, I wrote out the first season. I think if you look into the core story of The Indies, you see there’s potential to tell great stories for a very long time. I know sometimes Hollywood wants to go with a sure thing —hence all the reboots lately— but I think people are ready and itching for new and original content. The Indies: An Animated Series could scratch that itch. Want to see your animation dreams become a reality? 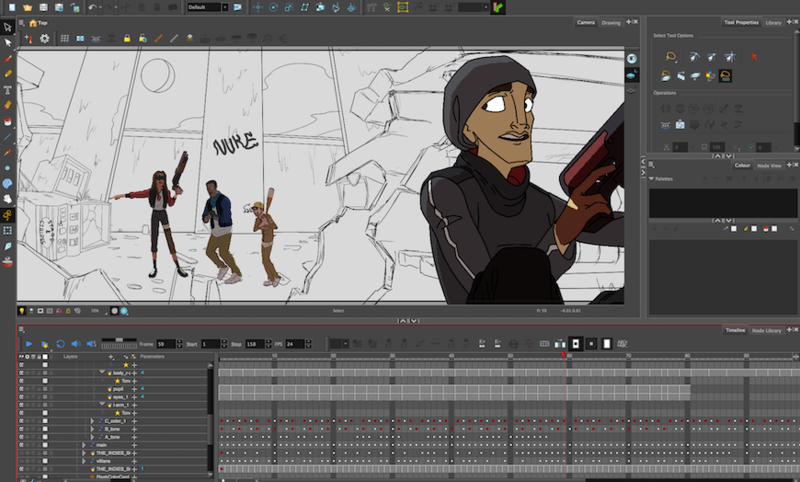 Start with a 21-day free trial of Toon Boom Harmony 16.